Every April, Ecojustice staff and our Board of Directors meet for our annual general meeting on British Columbia’s Bowen Island. It’s a time for everyone at our organization to get together, get inspired, and get excited for the year ahead. This year was particularly special because it was when we unveiled our 2017-20 strategic plan — something you can expect to hear more about in the coming months! The annual general meeting is always a little bittersweet. 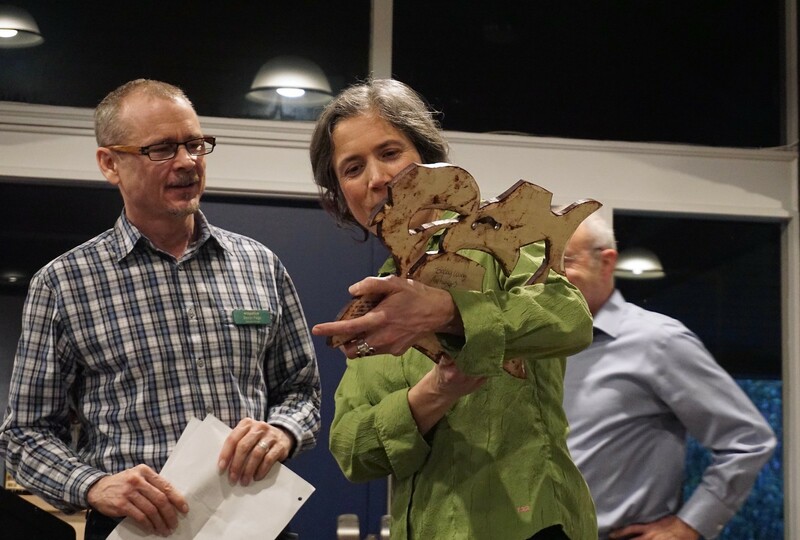 We get to welcome new board members to the Ecojustice family — this year they are David Rosenberg, Richard Secord, and Hugo Séguin — but it also means we have to say farewell (for now) to departing members. Retiring from our board this year are Deborah Curran, Murray McCaig, and Stuart Rush. Thank you for generously volunteering your time and sharing your expertise with us for so many years! While we spent most of the day talking about Ecojustice’s plans for the future, executive director Devon Page sat down with board member Trip Van Noppen for a fireside chat after dinner. Trip is the president of Earthjustice, our sister organization in the United States. You can trace the relationship between our two organizations all the way back to Ecojustice’s origins in the wake of the 1989 Exxon Valdez oil spill. Today, Earthjustice’s groundbreaking litigation continues to inspire Ecojustice’s work using the law to defend nature, combat climate change, and fight for a healthy environment for all. Listen to “Behind the scenes at the Ecojustice AGM” on Spreaker. Want to hear more like this? Let us know in the comments below! Thanks for posting this conversation between Devon and Trip – very informative. It’s so helpful in these current times to be able to know more about what can be expected in the months to come and the ways being considered to fight for Earth justice. Thank you so much for your kind words Elizabeth! Glad to hear that you enjoyed listening to the podcast – we’re so happy to be able to give committed supporters like you a look inside what we’re thinking as new challenges and opportunities emerge! Thank you so much. It’s this kind of outreach that helps to inspire us little people behind the scenes, giving us a clearer picture of what is evolving and what is at stake. I’m sharing this with my contacts. We really appreciate your support Antoinette! Your care and dedication to the environment is an inspiration for us as well, and we are so glad to have you by our side. Thank you for spreading the word about our new podcast! It does the heart good to see the degree of commitment to further the environmental ‘push’ despite the huge setbacks of a frankly bizarre US president. Thank you both!! Thank you so much for your kind words Janet! We are glad to be able to provide some inspiration and hope in dire times. Thank you for your support and commitment to our work! This was interesting to listen to. Thank you for sharing it. Enjoyed listening to this conversation. It sounds it will be extremely difficult to bring forth future environmental law suits, but thousands of citizens on both sides of the border are all working towards and supporting clean energy technologies. We need to stay positive! I verey much enjoyed this interview, something live to listen to, and encourage more of this in your reporting. Thanks for all you do!